Plain and simple: there is never a wrong time to make a healthy dessert, especially one with peanut butter! It just so happens that the other day was "one of those days" ... you know, a day that seems to revolve around food cravings, a day spent either wandering around the kitchen or on the computer searching your craving into every search engine imaginable. I was craving peanut butter. Oh, and chocolate. Of course. It's just in my nature. 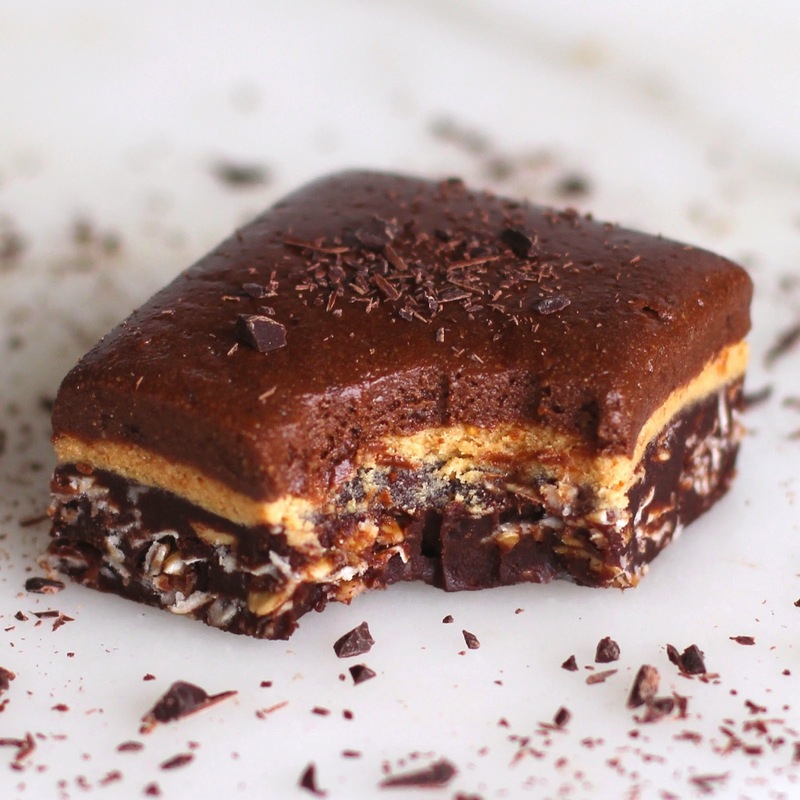 For about five hours straight, the magical combination of peanut butter + chocolate popped into every racing thought going through my head, which led to an undeniable craving for a sweet treat containing such beloved ingredients. Super soft, super chewy, super decadent and fudgy. It couldn't get any better! OH NO! I just remembered I made these for a friend! Do you think she'll notice the piece of fudge with the giant bite out of it? Despite how long the ingredient list looks, there are actually only 9 ingredients in the entire recipe! As if you needed another reason to make this though, right? 2. For the Chocolate Oat Fudge Layer- in a large bowl, whisk together the melted coconut butter, coconut milk, agave, vanilla and salt. Whisk in the protein powder, then whisk in the cocoa powder. Fold in the oats. Flatten mixture into the brownie pan and freeze while you make the next layer (freeze for at least 30 minutes, or until completely firm). 3. 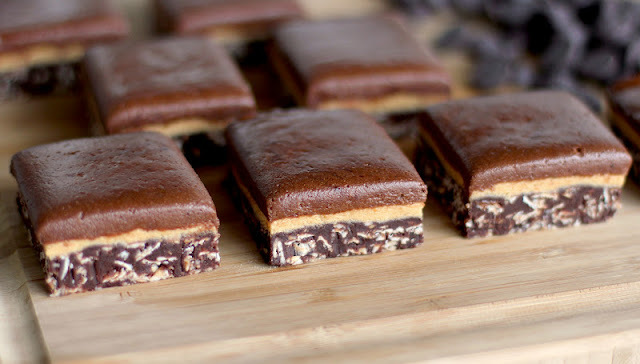 For the PB Fudge Layer- in a medium bowl, add the protein powder and top with the agave and peanut butter. Stir together until all powder has been absorbed (it should not be too dry/crumbly, it should be moist enough to roll into a ball). Scoop this into the brownie pan, spread to the edges of the pan and flatten (use a pastry roller if you have one, otherwise, put your hand in a sandwich bag and spread it manually). Refrigerate while you make the next layer. 4. 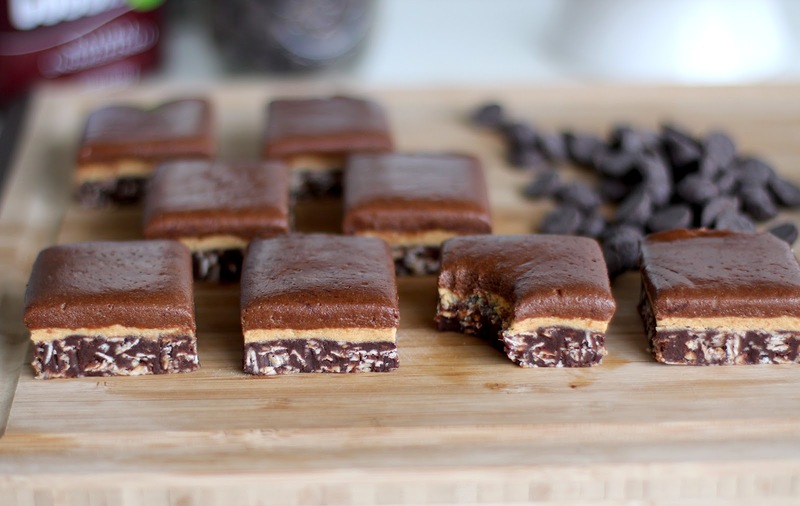 For the Chocolate-PB Fudge Layer- In a medium bowl, add the protein powder and cocoa powder and mix. Top with the agave and peanut butter. Stir until all powder has been absorbed (it should be a little more moist than the PB layer, but not by too much). Scoop this into the brownie pan, spread to the edges and flatten (again with the pastry roller or sandwich bag). Freeze for 30 minutes, then slice. Serve chilled. Use a plate and fork if you don't want to lick your fingers, but why dirty a plate and utensil? 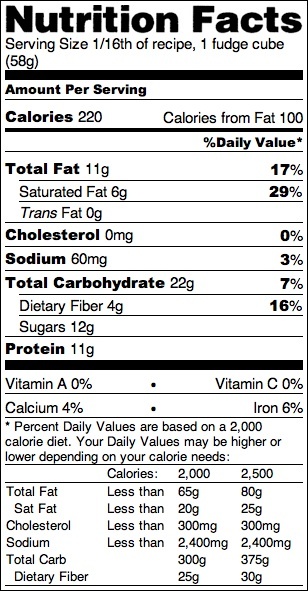 At first glance this looked a little high calorie/fat to me, but then I searched for the nutrition facts of another chocolate peanut butter fudge... 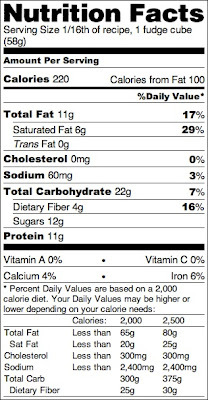 I almost cried... 1/16 of the recipe has 411 calories, 25g fat and 22g sugar! 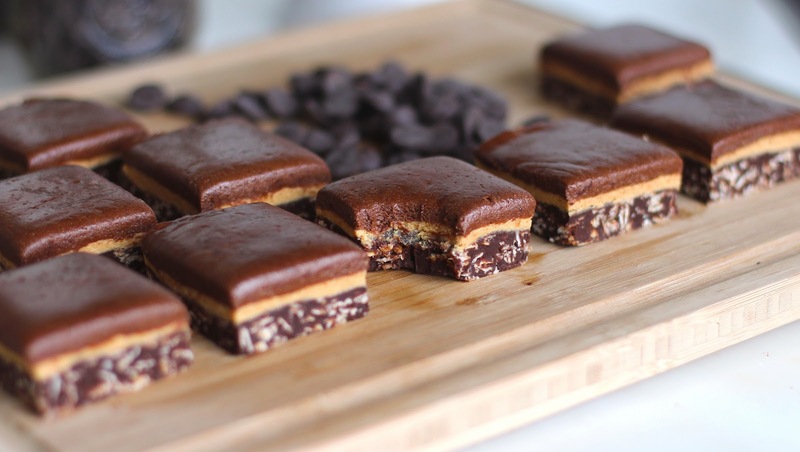 So let's all make this triple-decker chocolate PB fudge instead. We will cry with joy. Except I would've taken like, seven three pieces. Wow they looks really delicious! Thanks for sharing. Have a wonderful day. These look amazing and I cannot wait to try them! I have previously tried your pistachio cake and it was delicious. Love what you are doing with your blog and I hope I can eventually build up as many posts and recipes that you have! I'm glad you liked the pistachio cake! Hope you post more recipes too :) it won't be hard though, baking is addicting! Yes! these look awesome. They nearly jumped out at me on TS. I just love your blog!! Everything you post looks incredible (especially this)!! Oh yay! Hope you like them! Just curious... what type of protein powder do you use that is Vegan? I have a dairy allergy and can't use Whey powder. Thanks! Although soy protein powder works, I would recommend using egg protein powder (unless you're vegan). 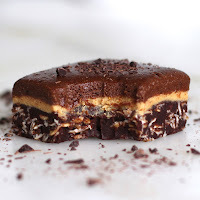 It's the closest thing to whey when it comes to texture (it doesn't taste good on its own, but if it's masked with peanut butter and chocolate it's no problem), all you have to do is omit the salt in the recipe. If you use soy protein powder also know that some brands require more liquid than whey/egg, so you may need to add a couple tablespoons of agave or peanut butter. Hope this helps! Seriously, you made a triple layered treat? And this is healthy too? Wow! You are a real genius! You live in arizona! Could I please come over for these beauties?! Wow. Just found your blog. So glad I did. 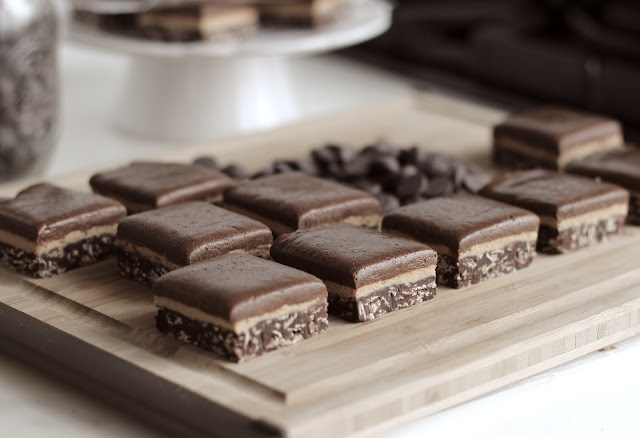 I will be making this fudge! I recently found your blog and I am just amazed by the creativity and elegance of each and every single one of your recipes! I really need to start stocking my kitchen with your "pantry staples" so I can continue to make all your recipes. 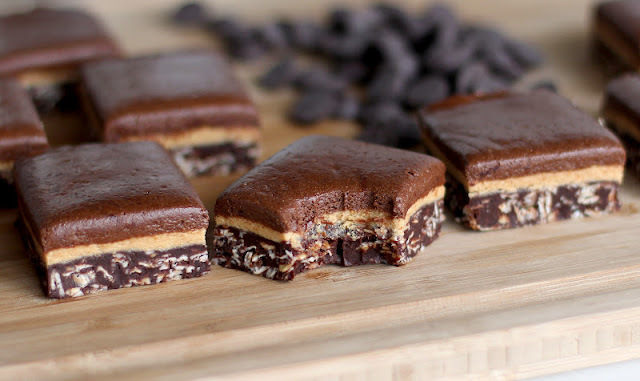 I made these the other day and OH MY GOODNESS... they are freaking awesome. I was hesitant at first but have no regret now after tasting them!! Thank you, your truly amazing! Please keep up all the great work! Hi! I am allergic to coconuts. Is there something else I can use? Hi Jess! For the coconut milk, you can use almond milk since it's thick and creamy too. I'm not sure what can be used instead of the coconut butter, as a reference, it has a texture similar to buttercream frosting. I would try using 1/2 cup of palm shortening (similar to coconut oil and butter but with no animal fat) but only melt it slightly, you don't want it to be completely liquid. If the mixture is too wet, add more cocoa powder or protein powder, if it is too dry, add more almond milk. Hope this works out for you! Saw this on a facebook link and decided to make it. It is in the fridge chilling now. As a vegan I used nonfat soy protein. Not a drink/shake mix but just plain soy protein powder. I compensated with a little extra agave, vanilla, cocoa, and peanut butter to get the two fudge layers smoother and to counteract the fact I wasn't using flavored powder. So far tasty. I can't wait to actually cut and try them. I was amazed at how smooth and silky the base was prior to adding the oats. Thank you for sharing your creativity with the world. I'm so glad you took the time to make the recipe :) I hope you love them! All your recipes are phenomenal!! Very inspirational too. I can't wait to try making them all!